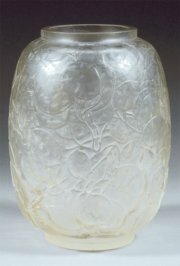 Heritage Auction Galleries of Dallas, Texas, held their first auction in New York City on Oct 14, 2010. The Illustration Art sale did well with art from the top artists, decently with art from the second-tier artists, and poorly with art from the third-tier artists. The auction was the second highest-grossing sale ever for the Illustration Art category, totaling over $3.75 million. 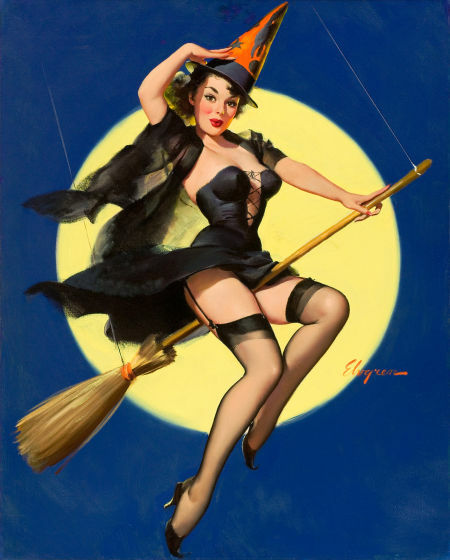 Top lot of the sale was #78043, a Gil Elvgren painting of a witch on a broom. Estimated to sell for $30,000 – $40,000, it soared to $167,300, including buyer’s premium. Prices for Elvgren’s seven offerings in this sale were all over the map, from $4,481.25 for a pencil on paper sketch of Miss Sylvania to $38,837.50 for a painting of Miss Sylvania to $167,300 for the top lot of the sale, above. 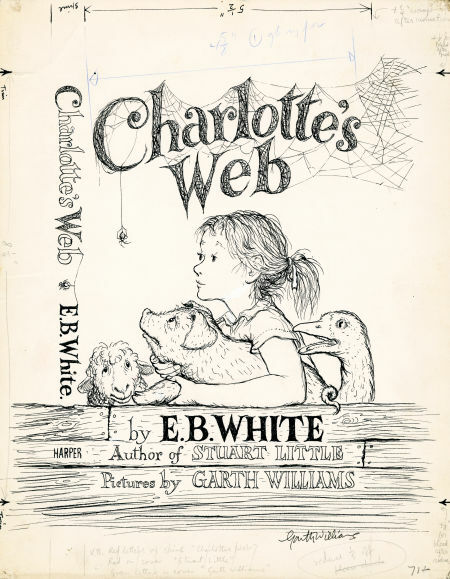 Original art from the 1952 children’s book, Charlotte’s Web, did extraordinarily well. The cover illustration, done in graphite and ink on paper, was the second highest lot of the sale, selling for $155,350, against a pre-sale estimate of $20,000 – $30,000. Individual illustrations from the book also did well, with prices from as low as $717, all the way up to $95,600, with an average price of about $10,000. 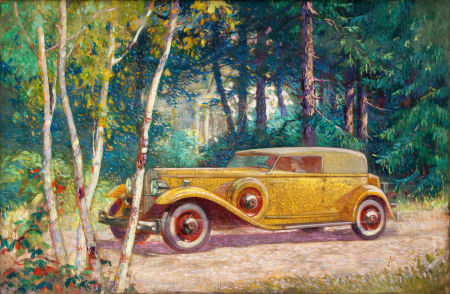 Several other artists commanded more than $60,000, including J.C. Leyendecker, Thornton Utz, Jesse Wilcox Smith, Howard Pyle and Norman Rockwell. As in the past, there were plenty of bargains to be had. Including the next day’s Internet only session in Dallas, over 180 lots sold for less than $1,000. A beautiful large 30″ x 46″ oil on canvas painting of a Packard automobile sold for only $896.25. If that’s not a bargain, I don’t know what is. For the complete results, you will have to register (free) with Heritage. You can view all of the paintings without results if you don’t register. Here is the link. Heritage Illustration Art auction, August 17-18, 2010. I’d like to explain how we arrived at the results for this show, starting with the preview party. Don’t get me started on preview parties, or I’m likely to tell you how they are a waste of a dealer’s time; how I feel used because preview parties are not for selling but for the promoters to have a social occasion; how hot the room was, and what a bad mood I was in during and after the party. But since you didn’t get me started, I won’t mention it. Friday was the first day of the show. Luckily the room had cooled down, so the temperature was comfortable for most of the day. Our room was in a corner of the building, so I think many of the attendees never even made it to our room. Attendance was light, mostly single older women, who did not seem to be interested in purchasing anything. And guess what? They didn’t. Friday was a long day from noon to 8 PM, with nothing of significance happening the entire day. It’s tough sitting there all day, waiting for something to happen, and trying to relieve the boredom. Someone remarked that this is a weekend show, meaning that attendance and action should get better on Saturday. The weather was cooperative on Saturday — chilly and raining a little — perfect weather for an indoor activity, like visiting an antique show. Attendance did pick up significantly, with mostly couples. By the middle of Saturday afternoon, I hadn’t sold a single item. I broke the ice with the sale of a book. OK, at least the ice was broken. Next a decent sale, but to a client of mine, not a new one from the Winnetka area. Finally, later in the day, more of our clients showed up and purchased several items. Sooo, a decent day as far as sales, but not a good one for the show, because these were already my clients. As of Saturday afternoon, we weren’t coming back to the show. Not to mention the unnecessarily long day from 10 AM – 6 PM. Six hours would have been plenty for the public and kind to the dealers. I expected equal attendance on Sunday, but I suspect it was a little lighter than Saturday. Didn’t know what to expect. I thought we could sell from zero to a more substantial number. What did happen was a couple of decent sales to new people — just what the doctor ordered. So now we’ll probably come back to try the show one more time, if they change our booth location to a more central one. Interest and sales were mostly items from the cabinets — no lamps or artwork. The only exception was the fabulous Ernst Wahliss sculpture of three witches on a broom, that I was showing for the first time. My clients were thrilled to get it and I was thrilled to sell it — it’s fragile and very difficult to transport and set up. 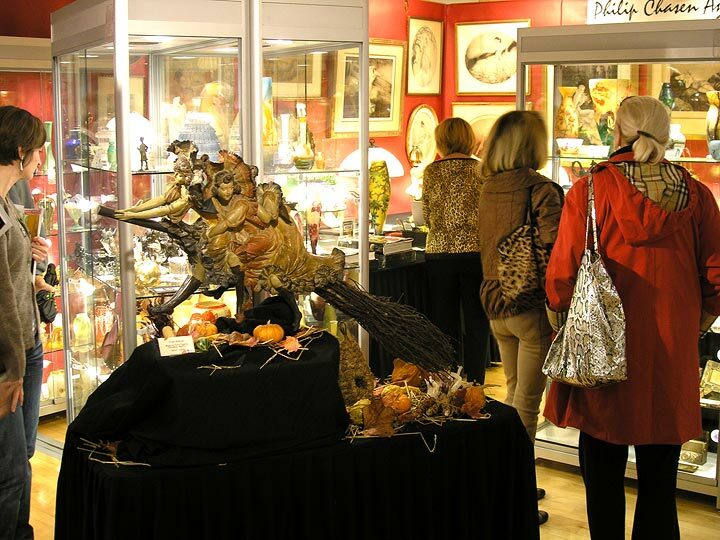 Previously the Winnetka Antiques Show and the Winnetka Modernism Show were each held once a year. The two shows have now been combined and the new combined show will be held once a year in October. This is my first time at the show. The building is not your typical exhibition space, as found at most convention centers. It has many rooms, so attendees have to search in each of the rooms, lobby and upstairs to find all the exhibitors. Our space is different from any other show as the room was divided in an unusual way to accommodate three exhibitors. It was tricky, but we made it work. 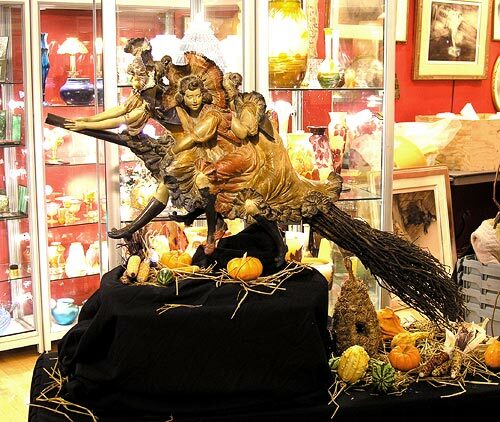 I’m bringing some items to this show that have never been exhibited before, including an unbelievable Ernst Wahliss sculpture of three witches on a broom. I’ve owned lots of Austrian ceramics before but have never seen anything as great as this. Also for the first time, I’ll have a super Tiffany Favrile blue miniature vase with millifiori decoration and a fine Van Briggle 1907 blue vase. I also brought another 25-30 items that I recently purchased, including a Satsuma bowl with underwater seashells and flora on the underside and a really great cloisonné vase with a dragon. The show is very diverse with top-notch exhibitors. There’s furniture, art, jewelry, glass, ceramics and most anything you can think of. The overall quality is higher than most shows, so it’s definitely worth a visit. I’ll do my best to post the results on Monday morning, but no guarantees. Some days you can do no wrong and others you can do no right. Unfortunately the latter was closer to the truth for this show. According to the promoter, Shawn Hastings, attendance was better at this show than the previous two. The problem for me was that the wrong people came. Many of my clients showed up at the show, but just to say hello and admire my items. It was frustrating getting the same response from so many of them. The show was not a total disaster. Friday was a bust with absolutely no sales. For half of Saturday, there were no sales. I started to write my Monday blog in my head, beginning with the fact that this was the only show in the last ten years where I’d sold absolutely nothing. Luckily business picked up a little on Saturday and late Sunday, so I didn’t actually write it. I probably made my expenses and a ham sandwich. Not exactly a good show’s pay, but not terrible. There was interest in Rookwood and Marblehead pottery and Lalique glass. This is the third show I’ve done in the greater Chicago area in the last seven weeks and that may be part of the problem. Possibly compounding the problem, I’m exhibiting at a fourth show in the greater Chicago area this coming week, in Winnetka, IL. Winnetka is a wealthy northern suburb of Chicago. I’ve got my fingers crossed that different people will attend the show, but whether they’re interested in what I’m selling is a question I can’t yet answer. I’ll let you know in a week if my experiment was a success or a failure. I’ll be bringing at least 25-30 new items that I’ve just purchased, including a few you wouldn’t think of finding in my booth. How about a Satsuma bowl with underwater seashells and flora on the underside, or a really great cloisonné vase with a dragon? The Arlington Park Antiques Show started setting up today. It’s held twice yearly in the fall and spring. Although it’s not a large show, there are enough quality dealers to make it worthwhile visiting. Unfortunately, there aren’t as many show dealers as there used to be. Many have become eBay dealers, retired, or died. The industry has suffered as not enough young people have entered the business. Young people don’t seem to be very interested in antiques. It’s a shame, but I imagine they will “discover” antiques as they age, their incomes increase and fashions change once again. But I digress. Besides my usual offerings of Tiffany, Handel and Pairpoint lamps and glass, French glass by Daum Nancy, Gallé, Muller, Argy-Rousseau, Le Verre Francais and Lalique, and Icart etchings and paintings, I will be bringing some items you don’t ordinarily expect to see in my booth. I purchased some very fine and unusual items in a private home. 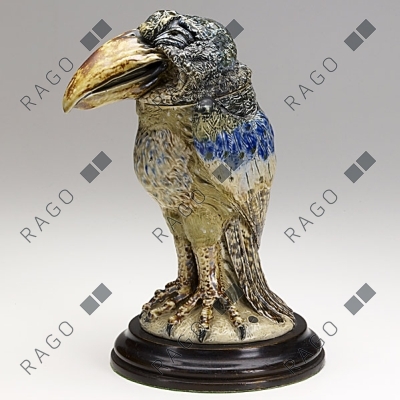 Included is a really fabulous cloisonné vase with a dragon; a great, large Satsuma bowl with underwater sculpture; two Vienna bronze items with birds; a fine English tea caddy and several other high quality, interesting objects. This is the first time I will exhibit them. Please make the time to visit the show. Introduce yourself and let me know if you are interested in buying, selling or trading. 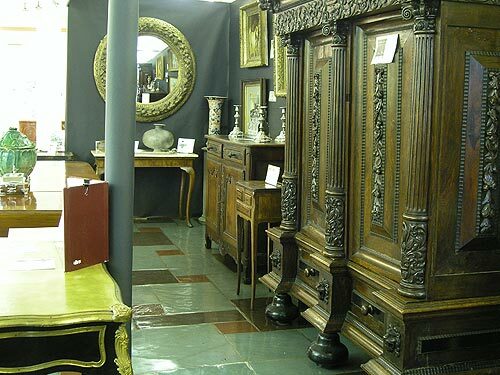 Heritage Auction Galleries of Dallas, Texas, opened a new gallery in NYC on September 1, 2010. It is located at 445 Park Ave. and 57th St. — a prestigious location. The location will feature a rotating window featuring selections from upcoming auctions. 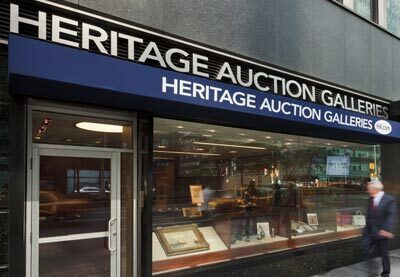 Heritage is now the third largest auction house in the world with total sales of more than $600 million, behind only Sotheby’s and Christie’s. Heritage started their auction business solely with coins, but has gradually expanded into many other categories. Rather than compete toe to toe with their larger rivals, they have cultivated specialty auctions such as illustration art, comic books and sports collectibles. This strategy allows them to compete in areas where the major auction houses are deficient. I requested comment from Heritage regarding the opening of their new gallery and received this response from Greg Rohan, President of Heritage Auction Galleries. We certainly don’t expect to be compared with Christie’s or Sotheby’s; that’s not our business model. We have a large headquarters building in Dallas, but our New York showroom is small, and was carefully designed to be a convenience for our consignors and clients. It’s centrally located on Park Avenue, near the corner of 57th Street, one of the top demographic foot traffic locations anywhere in the world. Visitors who come to our Manhattan “jewel box” with an advance appointment will be able to show their items to, and converse with, any of our experts in Dallas or Beverly Hills via video satellite. We also plan to introduce “simulcast“ auctions in New York, Dallas and Beverly Hills. 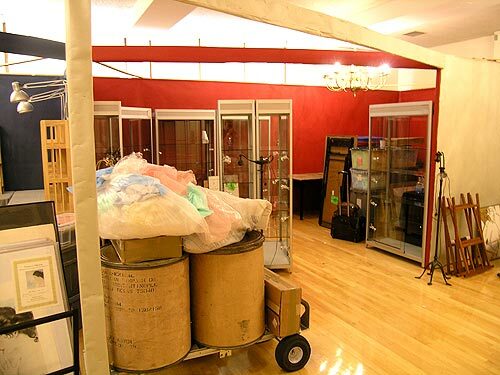 We are first and foremost an auction house utilizing cutting edge technology, as we always have. Our web site, HA.com, has over 500,000 registered bidder members, and gets significantly more traffic than Christies.com and Sothebys.com combined. That’s why over 70% of the lots we sell at auction sell to non-dealers – the highest percentage of any auction house. We expect our New York location to operate more like a boutique, even though we are by far the largest auctioneer of vintage collectibles in the world. In many categories, such as Illustration Art, Coins, Comics, Currency, and Movie Posters, we outsell all other auction houses combined. Of course one of the most talked-about features of Heritage’s new Manhattan venue isn’t high tech at all: It’s the Heritage Window on Park Avenue, which will feature a continually rotating million-dollar exhibition of highlights from upcoming Heritage auctions, across all of our categories. The items are on display 24/7. Norman Rockwell graphite and pencil on paper. Two Men Conversing, c. 1950s. Heritage’s first NYC auction will be an illustration art auction. It will take place in a rented location at The Ukrainian Institute, 2 E. 79th St. and Fifth Ave., NYC on October 15, 2010. The auction will include a fine assortment of art from the best known illustrators including Norman Rockwell, Maxfield Parrish, J.C. Leyendecker and Gil Elvgren. 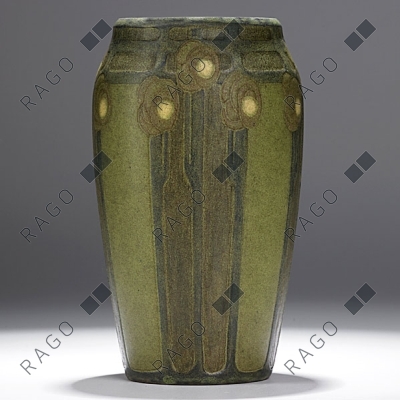 The results at Rago Auctions on October 1, 2010, showed just how much the public appreciated the assembled variety of pottery, glass, lamps and furniture. Many of the items were high quality and fresh to the market — a combination that’s hard to beat. Talk of recession is finished. Now buyers have to compete strongly for the best merchandise. 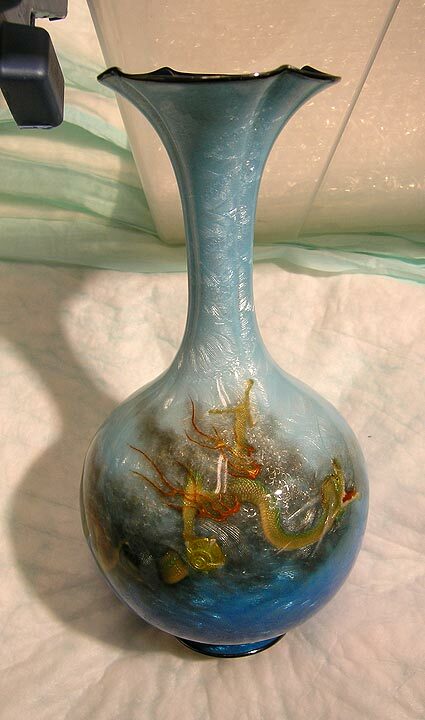 The top lot of the sale was a rare 7″ Marblehead vase, decorated by Arthur Hennessey. Even with a 1½” hairline crack (usually the kiss of death), the vase soared to $134,200, against a pre-sale estimate of $25,000-35,000. Bidding was fierce as this was only one of four known to exist. The Martin Brothers of London and Southall were nicely represented with nine lots, six of which were the very desirable bird tobacco jars. Four of these birds were among the top ten lots of the sale. Lot 209 was estimated to sell for $17,500-22,500. It doubled its estimate to sell for $39,040. Again damage didn’t seem to be much of an issue. The public was looking for excellent examples and they weren’t going to be deterred by a few chips or hairline cracks. Ceramics buyers are much more tolerant of condition issues than glass buyers. There were more than a couple of lottery winners at this auction. 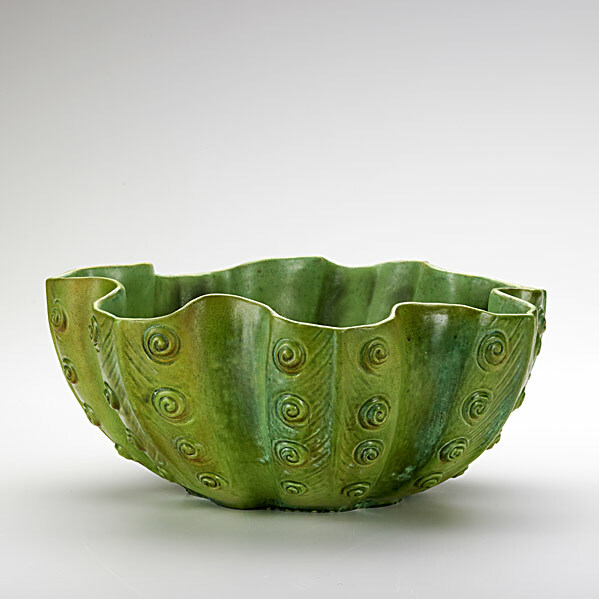 Lot #463 was a rare Tiffany Studios pottery bowl with fern decoration, the only example known. It was recently purchased at an estate auction in Pennsylvania for $115. It sold for $25,620, against a pre-sale estimate of $15,000-20,000. Not a bad day’s pay. I emailed David for his impressions of the sale. Here is his reply. 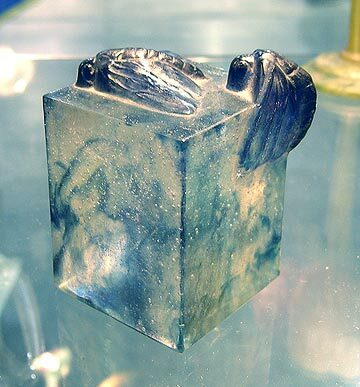 “We were surprised by how strong the Tiffany and Lalique performed in the sale. I knew the material well enough to understand it was unusual, but not nearly enough to think it could take off. The first Tiffany glass lot, the early blue vase (lot #473, $23,180), both the consignor and I thought wasn’t even Tiffany. That collection of glass (and including the large jeweled desk set) did more than double what we told the consignor to expect. The Tiffany pottery fern bowl was recently purchased by the consignor at a local auction for $115 and I knew it would do well, but the $25k was above our expectations. And the Tiffany sketch book, from his trip up the Nile in 1908, passed but sold after the sale. That was a surprise because there were like 28 sketches in the book which, individually, had to be worth $1500 – 2k each on the average and the reserve was $35k. And I’m thinking that the book, as a whole, is worth more than the sum of its parts. I would be remiss if I didn’t mention another wonderful story from the next day’s auction. 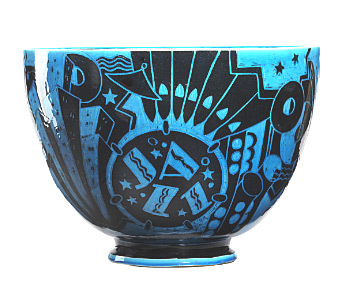 A picker had found a Cowan Jazz bowl and brought it to a Rago Monday appraisal day. It had been used as a planter, so it was very dirty, with mineral deposits to the interior glaze at the bottom and two hairline cracks to the rim. The picker wanted a $5,000 reserve. He was advised to permit Rago Auctions to clean and professionally restore the bowl. The bowl was presented at auction with all the details of the restoration. It carried a pre-sale estimate of $20,000-30,000 and sold for $158,600 — a fantastic price, but below the more than $200,000 for another example that previously sold in perfect condition. According to David, the result will make an important impact on the quality of the consignor’s life. 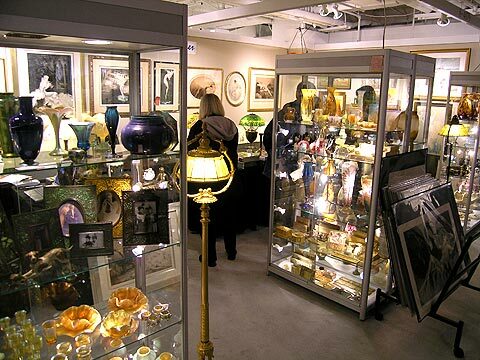 The Chicago Merchandise Mart Fall Antiques Show finished yesterday. Most of the dealers I spoke to were pleased with their results, but for the most part, they were below the results of a year ago. Attendance was good at the show, but selling was not quite as strong as before. No one I spoke to was ebullient, most were satisfied, and one dealer was quite unhappy. Personally, I was pleased with my show, but my results were also below a year ago. 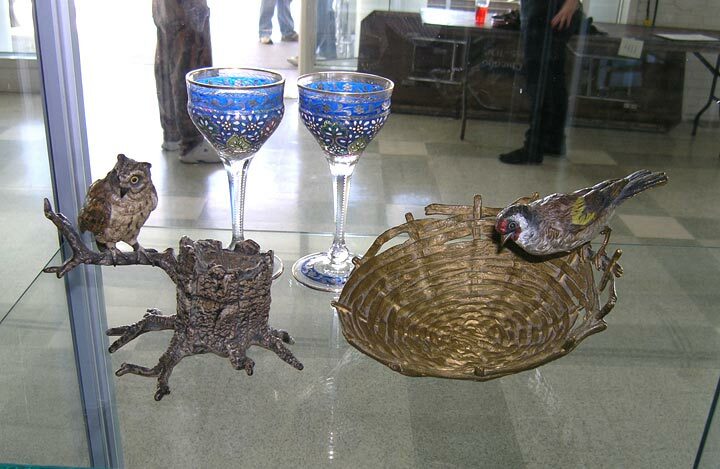 Interest was best in Tiffany lamps and frames, Daum Nancy glass, and Icart etchings. I am always thankful to my loyal clients who buy from me repeatedly, and very gratified for the new clients I made at the show. This was a good show, not a lucky one, as I sold items to more than a few clients. The Merchandise Mart shows are amongst my favorites of the year. 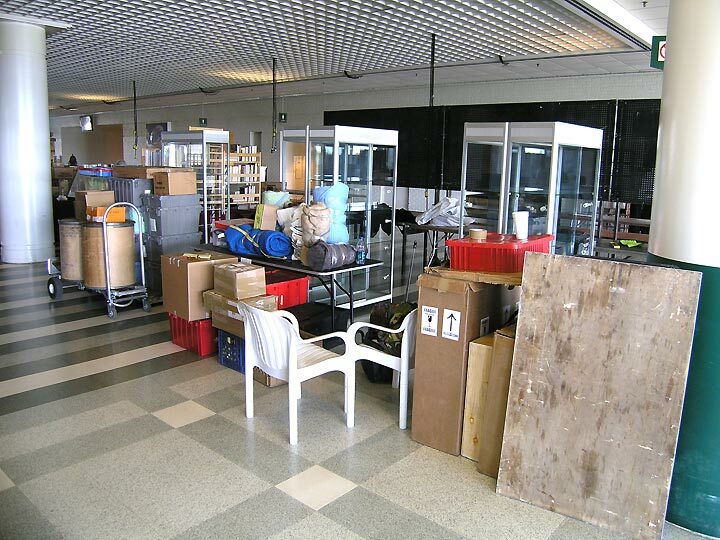 Setup and packup are always pleasant and efficient. All of the staff at the Mart, from the porters to the office, bend over backwards to be helpful. Downtown Chicago is great. Now if I can only convince them to get rid of the preview party, I’ll really be happy. Four hours of torture for me that always puts me in a bad mood.